Dr. Sut Jhally tackled the issue of Digital Technology and Addiction and the role of media and digital literacy in education. Dr. Jhally started his lecture with several questions such as: If social media platforms look different, is it then fundamentally different? Do we need new new teaching pedagogies nowadays with the emergence of different social platforms? 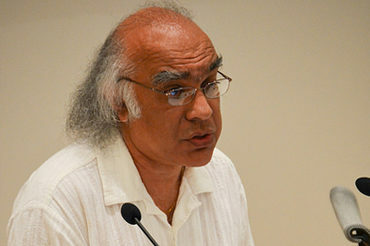 Dr. Sut Jhally is a Professor of Communication at the University of Massachusetts at Amherst, he is also the founder and executive director of the Media Education Foundation. He is the author many book, including The Codes of Advertising and The Spectacle of Accumulation. He also wrote and directed many films, including Dreamworlds 3 and Advertising and the End of the World.